– found out about this album (and artist) in the summer. Have listened to it almost every day since. Proper awesome. – two great albums from DT in my listening this year – Prezens, and the Lars And The Real Girl Soundtrack. Will always be remembered as the music playing when flapjack was born. – Imogen’s new album, Ellipse, was definitely one of the musical events of the year for me. – found out about Andy when we were in Belize in the summer. A proper music legend there. Sadly died a few years back. – truly remarkable jazz trio. I bought a lot of jazz records by ‘legends’ this year. Very few got close to the awesomeness of this. – really beautiful Stick/Bass duo album, very difficult to find. Stick it on Bandcamp, someone! – Lloyd will make an album in 2010, I’ll make sure of it. – 50 Foot Wave & Throwing Muses are also Kristin, so combined, she featured heavily in my year’s listening. Feel free to post a link to your own end of year list on last.fm, if you have one, with whatever notes you want to add to it. The key factor in my listening this year is discovering Spotify and getting to listen to lots of things that I don’t own. I have often opted for artists I remember listening to in the past, which is how groups like ZZ Top figure in there (and much enjoyment has been had in the combined pleasures of nostalgia and discovery). but that only really tells half the story of the year. somehow need to do additional list for live music seen this year. was going to blog it but been so long since i used the blog i can’t even find it. a facebook note on my ‘top ten musical events of the year’ is the best i can do. 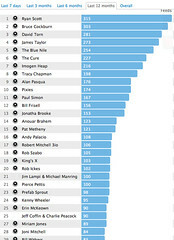 forgot to include the link for my fb note http://tinyurl.com/yd6ylww very little in common with our charts this year Steve. have to look into getting you up to Leeds for a gig in 2010.